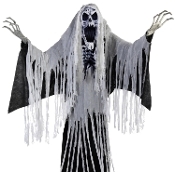 Go big this Halloween and decorate your haunted house with this gigantic standing Phantom Haunting Ghost Spirit animatronics prop! Prop is cloaked in shredded fabric and stands approx 6-feet 4-inch tall. Featuring a light-up face and chest, moving arms and rotating turning torso, and a wailing shriek that is sure to chill even the bravest of souls! Animations and sound effects: Face and chest light up, Arms move and torso turns, Wailing shriek with volume control. Transform your Halloween decorations from just scary into a nightmarish experience with this terrifying entity. Activation options: steady-on, *Step-Here pad (*YES, Included), infra-red sensor (works up to 6.5-feet away and works in all lighting conditions). UL power adapter that plugs into any standard outlet. Size: Approx 76-inch (190cm) H x 38-inch (95cm) W x 39-inch (98cm) D.
Materials: Iron, PVC, polyester and cotton.